Hello again! Linking up with WIWW at the Pleated Poppy. If you're in need of Christmas cards or tags, go handmade this year and get them now from my shop. Remember when I wore this in the summer with sandals. I think this dress adapted great to fall with boots. If it stays colder like today's temps, I'll throw on a bright colored blazer. I wore this outfit to a family gathering a couple of weeks ago. You can barely see in the picture but I have pink striped socks peeking out of the top of my boots. I've just recently started wearing the socks out/ jeans tucked in look. I've seen some people around here who just don't get it right, so I stayed away the first year this look was popular. See more of the last outfit HERE at Savvy Southern Style and another boots and socks outfit HERE. What have you been wearing? 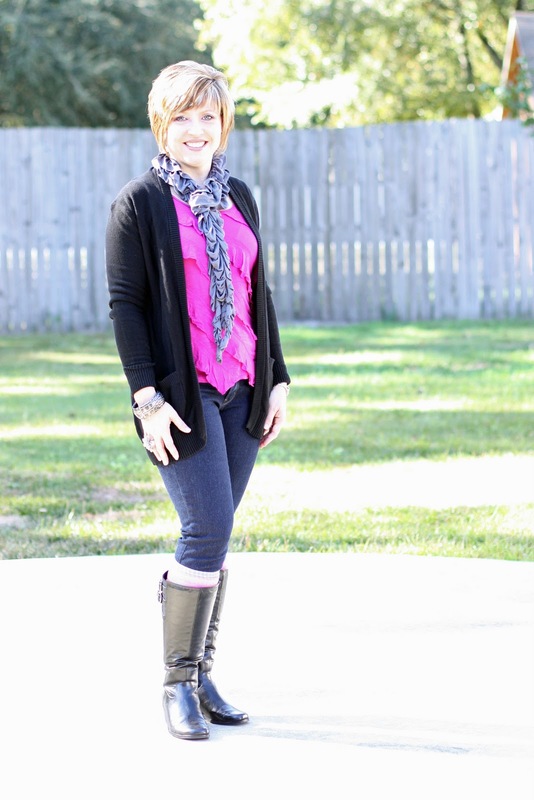 Do you embrace the boots and socks look or shy away? Winner of Shabby Apple giveaway!